Tim Lydon is a contributor to Writers on the Range, the opinion service of High Country News. He writes in Alaska. Forget for a minute that President Donald Trump recently pulled us out of the Paris Climate Accord. Or that a burgeoning list of corporations and communities are proceeding with the agreement’s goals anyway, including Colorado, which last week became the fourth Western state to formally reject Trump’s move. Instead, look at what just happened in Antarctica. On July 12, after months of anticipation, one of the largest icebergs ever observed sheered away from the Larsen C Ice Shelf on the West Antarctica Peninsula. The thing is over 2,000 square miles in size and nearly a quarter-mile deep in places. It’s the size of Glacier National Park, or the state of Delaware. The first thing to acknowledge is scientists do not agree whether climate change prompted the iceberg’s release. The discharge of sometimes massive bergs naturally occurs on Antarctica ice shelves, and signs of the eventually 120-mile fissure that produced the berg were observed as early as the 1960s. Nevertheless, the event puts on display the type of process climate change can trigger. And it foreshadows what scientists ominously warn will occur in Antarctica if humanity does not quickly curb fossil fuel emissions. It all has to do with the way Larsen C broke off, more than its impressive size. Peeling away from two bedrock anchor points over 100 miles apart, scientists say it may have destabilized the entire Larsen C Ice Shelf, fourth-largest in Antarctica. Two neighboring ice shelves to the north, Larsen A and Larsen B, suffered the same fate in 1995 and 2002, respectively. No one knows how long the ice shelf would take to break up, and it could take many years. On the other hand, Larsen B shattered like a giant glass plate in just one month, startling Antarctica observers because it had been stable for millennia. 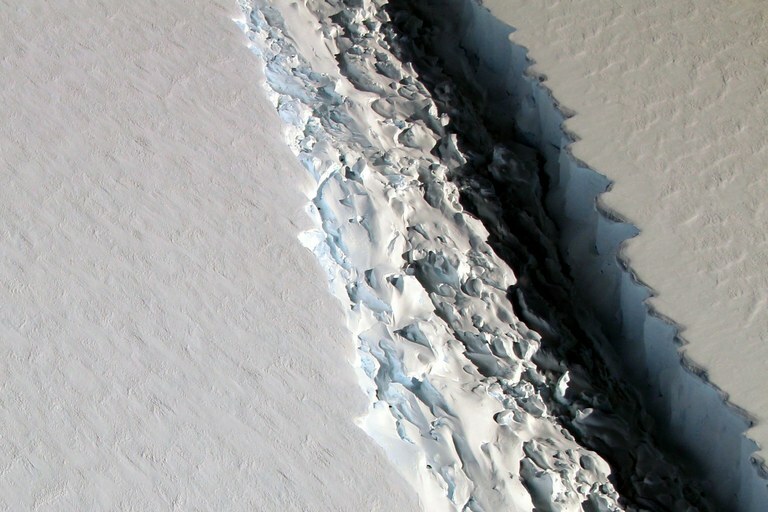 A Nov. 10, 2016, photo taken by scientists on NASA's IceBridge mission shows a massive rift in the Antarctic Peninsula's Larsen C ice shelf. Importantly, disintegration of the Larsen C would add virtually nothing to global sea level rise, as its entire mass is already afloat on the ocean. But ice shelves act like dams, holding back sometimes enormous land-based glaciers. If Larsen C goes, currently stable glaciers will begin pouring into the ocean. That new freshet would increase sea-level rise, which European researchers recently showed tripled since 1990. In Alaska, we’ve watched this for years. Warming likely nudged the Columbia Glacier in Prince William Sound, the South Sawyer Glacier south of Juneau, and others from previously stable positions, prompting retreats so rapid that local maps quickly became obsolete. The ongoing melting adds to rising seas. A long-simmering concern is that the same will begin happening in Antarctica, unraveling its massive store of ice and tipping projections of global sea-level rise toward worst-case scenarios. So in the wake of the giant Larsen C berg, it’s worth noting two nearby ice shelves disappeared in the last two decades, and a third is now in potential jeopardy. The progression has been southward, toward the continent’s main body of ice. Even as climate is not clearly implicated, it presents a warning. Already, people are squeezed by sea-level rise. It contributes to the destruction of homes, roads and infrastructure in several Alaska villages, where U.S. citizens are losing livelihoods and cultural traditions and imminently approaching climate refugee status. Meanwhile, the West’s low-lying coastal cities are taking stock of damage in Alaska. From San Diego to Seattle, municipalities map where seas are projected to inundate streets, wetlands and neighborhoods in the years ahead. Regardless of climate’s role, unfolding events in Antarctica will further inform their work. But in the West, it’s not just coastal cities that should be concerned. At our border with Mexico, long a place of violence and injustice, climate change already fuels illegal immigration. Floods, fires, drought and conflict in Central America increasingly push people northward. In the years ahead, rising seas are expected to prompt further migration globally, potentially compounding concerns in the West. And Republicans think they need a border wall now? Which brings us back to Trump’s Republican-backed Paris pullout. Science shows we are already locked in to some degree of climate warming and rising seas in the years ahead. The accelerative effect from Antarctica is yet uncertain. Nevertheless, science shows global cooperation toward swift cuts to coal and oil can reduce surface melting of ice across the planet, easing us back from worst-case scenarios. That must be why hundreds of U.S. corporations and communities are scrambling to support the Paris Agreement.